Starwood’s Great Taiwan, China Struggle! 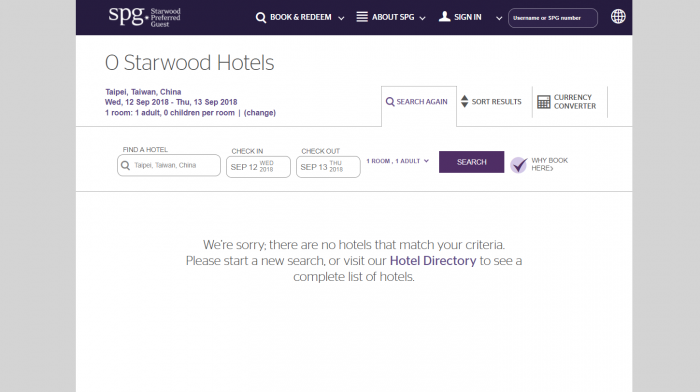 Seems that Starwood’s website has quietly followed China’s orders and added the word “China” after Taiwan that has caused havoc on the website! Now, when you execute a search for Taipei on the website, you are presented the search result above that would indicate that there are no SPG affiliated hotels in the city which obviously is false. When, however, you keep typing the city, you are presented various hotels in the city and you can bring up the prices for individual hotels one at a time. I believe that most of the airlines gave in and added the word China after Taiwan to please PRC. I am surprised that the Marriott’s own website still hasn’t done this, however, considering the Tibet issue they had (read more here). Thanks for a reader that alerted us for this SPG website error!